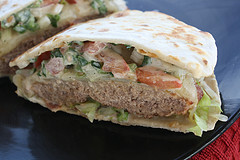 Discripiton:The Quesadilla burger has recently become pretty popular. 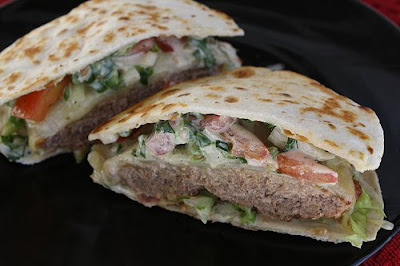 If you are not familiar with this rather unique burger; the quesadilla burger is a grilled burger topped with cheese, Pico de gallo salsa, and a delicious sauce. The burger is placed between 2 lightly fried tortillas. This is a great switch up from your normal hamburgers. Be aware this does take some work but its well worth it. If you want to save time you can buy premade Pico de gallo from the store. 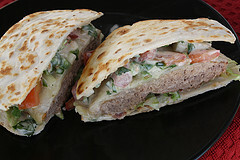 The highlight of this recipe is the cilantro mayo sauce that goes onto these burgers, it really is dominant. You can use an indoor grill pan or just a regular skillet to cook these burgers if you choose. Enjoy. Step 1: To prepare Pico de Gallo salsa- In a medium bowl combine tomatoes, onion, jalapeno peppers, green pepper, and cilantro. Add lime juice, salt and pepper. Put into the refrigerator. Step 2: To prepare Cilantro Mayo- In a small bowl combine mayonnaise, lime juice, honey, Worcestershire sauce, garlic, cumin, cilantro, jalapeño pepper, salt and pepper. Place into the refrigerator. Step 3: In a large bowl combine hamburger, pork, egg, milk, ketchup, mustard, onion powder, and garlic powder. Add breadcrumbs until the meat mixture no longer sticks to the bowl. Form into about 6” patties. With your finger make a depression in the middle of each burger. Grease and heat an outdoor or indoor grill and fry burgers until they are done. Within the last few minutes of cooking top with pepper jack cheese slices and grill until the cheese has melted. Remove from the grill. 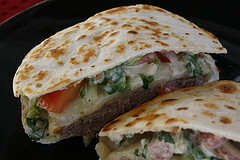 Step 4: For each burger – In a small skillet, heat and lightly brown 2 flour tortillas. 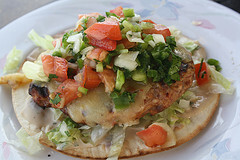 Assemble burgers by spreading some Cilantro mayo onto one side of the 2 flour tortillas. Lay out one flour tortillas and put lettuce and crumbled bacon on top, Add the burger on top of that, and add some Pico de Gallo on top of the burger. Place the other flour tortilla on top. Slice in half.